You may recognize Miss Lawrence from Fashion Queens, but before that, he rose to fame on The Real Housewives Of Atlanta, where Lawrence served as Sheree Whitfield’s hairdresser and confidante. You may also remember his song, Closet Freak, that Lawrence recorded with the help of fellow RHOA star, Kandi Burruss. Or maybe you don’t, because it didn’t do well. In any event, many fans were bummed to see him leave, considering he always provided some comic relief on a show that is filled with dramatics and diva behavior. But why did Miss Lawrence really leave? Many have speculated that is was due to the homophobia that some of the ladies showed, but according to Lawrence, that is not true. Instead, he insisted that it had a lot more to do with the fact that no one is ever held accountable for their actions on The Real Housewives Of Atlanta. And that’s not all he dished about. After Real Housewives of Atlanta's NeNe Leakes stint in the hospital due to a blood clot in her lungs, the reality star has been honing in on healthcare. And who better to hone with (on television, no less) than Dr. Oz? Newbie housewife Mynique Smith instagrammed the above picture of with the caption "Ur girl @NeneLeakes did a great job on Dr. Oz today @GregLeakes #health #educated." 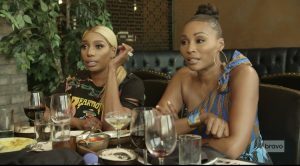 Of course, if NeNe's making the talk show rounds, one of her RHOA co-stars has to work to keep up with the the Joneses Mrs. Leakes by scoring her own televised sit down. Gone with the wind fabulously cray-cray Kenya Moore dished on her friendship (or lack thereof) with the Neenster to Wendy Williams. So Mynique is kissing Neen's booty while Kenya is trashing it…this isn't going to end well…but it's going to be fun to watch!